You say "toh-may-to", and they say "to-" eh, doesn't really matter. What you say goes anyway, right? You just wish the after-effects of this weekend's drink fest would obey and go away. You must press on and make it through the day, though, because when the boss is away, underlings slack all day. Besides, it's Monday, so you can get away with being a little groggy- as long as you have on shoes that distract people from that beleaguered look on your face. Walk tall in a pair of high and mighty heels like these Fem-bot-looking platforms from Bruno Frisoni. 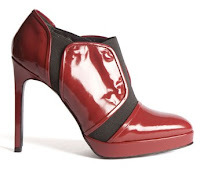 With a 4.7 inch heel and patent leather accented by elasticized gores, these booties say you don't play (and yet, you're somehow still a riot). It's been said that a Bloody Mary is a pretty reliable hangover remedy, but that's more a brunch drink than something you'd order at happy hour. 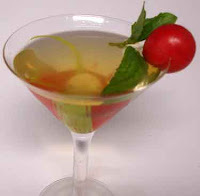 Opt instead for a Tomato-Basiltini (image courtesy Intoxicated Zodiac). From the folks at Intoxicated Zodiac (check Scorpio), it says you're the kind of gal who likes flavor but isn't all about the sweet stuff. Have your bartender muddle tomato water, a little sea salt and 3 fresh basil leaves. Then add Prairie Vodka (or other organic vodka with rustic notes) and shake over ice. Tomato water is hard to come by, but be flexible and tip well if your bartender is able to figure something out.